Ms. Cao is the Chairwoman of Shun Cheong Holdings Ltd., a company listed on Hong Kong Stock Exchange since 2006. Prior to that, she had over 10 years of experience in building large-scale enterprise software, project management, and leading development in various companies in the United States. Ms. Cao holds a bachelor’s degree in Automation Engineering from Tsinghua University, China, and a master’s degree in Electrical Engineering from Wright State University. Mr. Mo is the Chairman and CEO of SouFun Holdings Ltd., a NYSE listed company. He has over 20 years of experience in the provision of on-line information and analysis on the trading, leasing, financing, and valuation of real estate properties. Mr. Mo is also a director of Shun Cheong Holdings Ltd., a Hong Kong listed company. He holds a bachelor's degree in Mechanical Engineering from South China University of Technology, a master's degree in Engineering from Tsinghua University, China, and a Master of Arts from Indiana University. Mr. Mo is a director of Tsinghua University Alumni Association and the President of Master's Degree Graduates of Tsinghua University School of Economics and Management. He is also an inaugural member of the Yale Asia Development Council and an advisory board member of the Real Estate Department of Baruch College. Ms. Zhang joined the NYMA family after serving as the Principal at Stuyvesant High School for four years. It is considered one of the finest high schools in America. Born and raised in China, Ms. Zhang majored in Electrical Engineering. After earning a bachelor’s degree, she came to NYC to continue her education and received a master’s degree in Applied Mathematics. Subsequently, Ms. Zhang has spent her entire career in education. She began teaching incarcerated women at Riker’s Island and continued teaching Mathematics at Forest Hills High School in Queens. Following her years in the classroom, Ms. Zhang became an administrator. In 2006, Ms. Zhang was selected to serve as the Principal of the Queens High School for the Sciences at York College, one of the Specialized High Schools in New York City. With this appointment she became the first female NYC Principal who grew up in Mainland China. After serving there for five years, Ms. Zhang became a Network Leader for Children’s First Network 201, which supported over 30 high schools with a combined population of 50,000 students. In 2012, Chancellor Dennis Walcott named her the interim acting Principal of Stuyvesant High School. She was officially appointed as the permanent Principal 6 months later. Ms. Zhang’s journey through the New York City educational system has been impressive. She is a successful and very well respected educator. 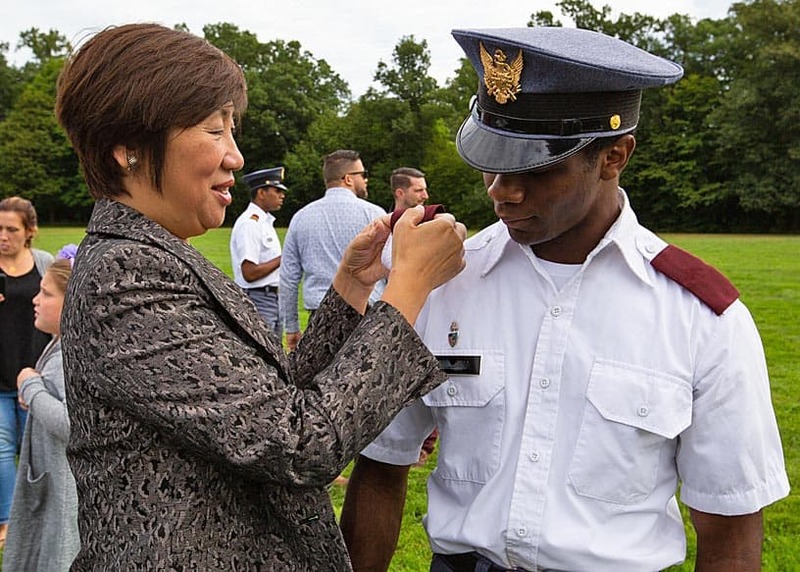 After 28 years of service to public education, she was extremely proud of and excited by her new role as the Superintendent of the New York Military Academy. Mr. Mortimer is President and a Trustee of The American Assembly, a national, non-partisan, and public affairs forum founded by Dwight D. Eisenhower in 1950 and affiliated with Columbia University. Before joining The American Assembly, he worked at Kuhn-Loeb & Co., an investment bank. Mr. Mortimer was appointed Commissioner of the Palisades Interstate Park Commission and serves as Vice President of the commission. He is the former Vice Chairman of Scenic Hudson, Inc., and is a director of the Scenic Hudson Land Trust, one of the county’s largest land trusts dedicated to preserving open space. He serves as president of the Mary W. Harriman Foundation. During more than thirty years as a Director of the New York City Ballet Company, he has held a variety of board positions before becoming Director Emeritus. Mr. Mortimer is a member of the Storm King Arts Center Council and serves on the Metropolitan Museum of Art’s Visiting Committee of the Department of European Paintings. He has been involved in various capacities with the Whitney Museum, the National Purple Heart Hall of Honor, New York Council for the Humanities, and the Economic Club, among other organizations. In addition, Mr. Mortimer is affiliated with several membership organizations, including The Council on Foreign Relations. In June 2014, Mr. Mortimer was nominated by NYS Governor Andrew Cuomo and confirmed by the State Senate for appointment as a member of the Palisades Interstate Park Commission. Mr. Mortimer holds a Bachelor of Arts from the University of Denver. He is married to Shelley Wanger, a Senior Editor at Pantheon and Alfred A. Knopf. Jin Xu got his PhD in Finance from the University of Texas at Austin. He worked as a portfolio manager at Zebra Capital and sequentially a quant trader and portfolio manager at HAP Capital. He published an article at one of the top finance journals which was featured in Business Week, Forbes, Bloomberg, and other news outlets. Mei Ye is a Senior Advisor to McKinsey & Company and was formerly a Senior Expert and Consultant with the firm. Mei is a specialist in corporate governance and serves on the corporate boards of Shenwan Hongyuan Group in China and Bekaert in Belgium. In addition, Mei has a passion for education and philanthropy. She is a board member and founding council member of Future China Society, SFY Foundation, and Stanford Global Projects Center. Mei has a master's degree in International Economics from the University of North Carolina at Chapel Hill and a bachelor's degree in Law from Fudan University in China. She is the co-author of China Vignettes: An Inside Look at China (Talisman, 2007) and has written nine children’s art books. Joah Sapphire is the founder and President of Global Dynamic Group, LLC. He received his bachelor's degree from Cornell University and his master's from Columbia University. Joah currently leads the firm, Internet of Things Solutions, in a highly regulated industry. He has twenty years of experience in both the public and private sector. Previously, he was a founding partner of Verulam LLC, China, a representative of Ospraie Management, CFO of NROTB, Deputy Commissioner of Suffolk County, Finance Director of Nassau County, and a Senior Analyst in New York State Assembly. Joah serves as an adjunct professor for Columbia University’s School of International and Public Affairs. He is also an industry affiliate of Cornell University’s Program in Infrastructure Policy and a member of the Advisory Board for the University of Buffalo’s Institute for Sustainable Transportation and Logistics.